Sebastian Vettel (1st, 1:42.841): "It was a strange feeling at the end of Q3. It's already strange when you stand in the garage with only two minutes left in the session, but much worse when you see the others making their final attempt and there's nothing you can do! I was watching the sector times closely with Romain, Nico and Mark in particular. Mark started with a purple time in sector one, then Nico went purple in sector two and then Romain, but fortunately my last sector was fast enough to just stay ahead. It's a great feeling as it could have gone wrong, but I'm very happy with the result. The car has been phenomenal all weekend. Yesterday the gap to the front was a bit of a surprise, but today was a bit more what we expected with the Mercedes being so close." Mark Webber (4th, 1:43.152): "I'm a bit disappointed to be fourth. It's quite tight and there were some good lap times being set. We're on the second row, it would have been better to have been on the front row, but it's a long race tomorrow and we can do something from there. We've got a very good race car. It was hard to match Seb in the last sector; he's always been strong in Turns 20 and 21." Christian Horner, Sporting Director: "A really impressive performance from Sebastian today. Having been quick in P1 on the prime tyre, fast in Q2 on the softer tyre and setting an incredible first lap that put him 0.6 seconds clear in Q3, we elected to take a strategic approach to tomorrow and not do the second run to save a new set of soft tyres. In the end it was very tight with Nico, but once you've made your decision you're committed. Mark was tremendously quick in Q1 on the harder tyres, which he's been fast on all weekend. He progressed through Q2 with no issue and in Q3, despite going purple in the first sector, he just missed out on the clean side of the grid. But, nonetheless first and fourth is a great place to start tomorrow's race." Thierry Salvi, Renault: "Sebastian took a risk sitting out the last lap, but nevertheless got pole doing only one run in Q3! The car was strong today and has worked particularly well on this city track, which features a lot of low speed corners where drivability and engine response are key. 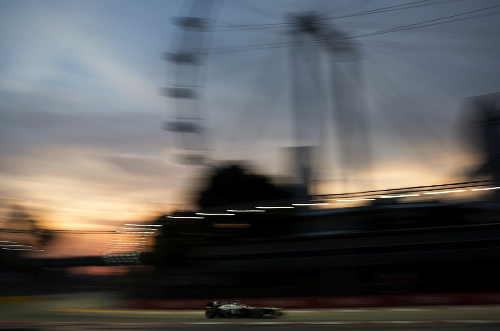 Pole in Singapore is very important on a track where overtaking is difficult." Felipe Massa (6th, 1:43.890): "Having struggled so much yesterday and in the third free practice session, today in qualifying, we finally managed to put together a good lap, completely changing the set-up on the car. Certainly the gap to the quickest cars is still big, but today, doing a time that is close to that of the Red Bulls or Mercedes was really difficult, partly because they have not suffered as much as us from a lack of grip and because we find ourselves on a high downforce circuit. I am expecting a difficult race because anything can happen here and tyre degradation is particularly high, even if I hope we have a good race pace and can be competitive. It's tomorrow's race that counts and we will do our utmost to improve our position in the Championship. My effort over the next seven races will be the maximum, because I would like to end my time with Ferrari in the best way possible." Fernando Alonso (7th, 1:43.938): "Today's result isn't surprising, because from the start of the season, on average we have always started from between sixth and eighth place and then made up ground in the race, which we will try and do again tomorrow. The updates brought to this race have gained us a tenth of a second on our competitors, a result which matches our expectations. Even if the gap to the leader is still significant and the improvement might not be that evident, we cannot say our engineers have not put in the effort, because everyone has done a super job. Expectations for tomorrow are still high, even if in the meantime, our rivals have not wasted their time and along with other teams like Mercedes and Lotus have made a further step forward. Faced with this, we must be realistic and try to make the most of any errors they might make. I think the podium can be within our grasp tomorrow, if we have a perfect race and make the best choices in terms of strategy, tyres and the right number of stops. Here in Singapore, in five years there has always been a safety car and for that reason, here more than anywhere else, luck can make the difference." Pat Fry: "Today we managed to improve both cars, finding the right compromise between performance over a single lap and also on a long run. Even if this was not enough to put our drivers on equal terms with those in the top places, we worked well as a team to extract the most from the package we had available to us. There were definitely some external factors that didn't do us any favours, such as the stop-start nature of the track and the lack of grip that seemed to affect us more than our rivals. Here, only those with the best traction manage to be comfortable when tackling the numerous chicanes and that explains the difference in performance between us and the cars at the front and the size of the gaps compared to those at Monza. Historically in Singapore, there is an almost hundred percent chance of seeing the race neutralised and this year too, we will have to be ready in case the Safety Car comes into play. In some instances this could be a help, in others it can destroy your race and so we need to think about having a flexible strategy. Here, reliability also plays a very important role, because the high temperatures put the cars under a lot of strain, also from a mechanical point of view. Ahead of us we now face one of the most difficult Grands Prix of the year and many variables could affect the outcome: we will try and push to the maximum, making the most of any opportunity." Jenson Button (8th, 1:44.282): "The car felt okay and I'd say it was a reasonable qualifying session for us. There's still quite a bit of progress to be made, but we've been doing a lot of set-up work this weekend to improve the car and I'm happy about that. We'll see what we can do tomorrow, so as to make the best of where we are. It's likely to be an exciting race because the tyres are working in a very unusual way. As a result there are going to be a lot of different strategies, so it'll be interesting to see how everyone get on. It's going to be difficult to overtake the cars in front of us, but we'll see what we can do. Having said that, I'm really looking forward to it. It's always a very tough race here, but that's what we do all the training for." Sergio Perez (14th, 1:44.752): "That was quite a disappointing qualifying session for me. I think today we should have made it through to Q3. Basically, when the track got better in Q2, I just couldn't improve my time. The rear felt quite loose and I therefore found it difficult to maximise the full potential of the car. I think the changes we did after P3 didn't help, and I probably lost a bit there. Also in my out-lap I had quite a bit of traffic which didn't help either. To lose two-tenths here is very easy ‘ and today we did it. As a result, it's not going to be one of the easiest races out there for me tomorrow, starting from P14. It'll be difficult for me to overtake, so we need a good strategy and good pace throughout the race. But not everything is lost: we've seen in the past that anything can happen here and there's a big difference between the Prime and the Option so we'll see what effect that has from a strategy point of view. Obviously, our aim is to score some points." Martin Whitmarsh, Team Principal: "Jenson delivered a typically strong and fault-free performance to qualify about as well as we felt our car was capable of qualifying here this evening. Checo, meanwhile, is naturally frustrated not to have made it through to Q3. It's a tricky circuit and an unforgiving qualifying format, though ‘ so, with so many cars so close to one another in terms of pace, it's all too easy not to make the Q3 cut. Having said that, both Jenson and Checo have shown themselves in many races this year to be well capable of fighting their way through the field from less than stellar grid slots to solid points finishes by flag-fall, and I have no doubt whatsoever that that's what they'll both be trying their damnedest to do when the five red lights go out on the Marina Bay starting gantry tomorrow evening." Romain Grosjean (3rd, 1:43.058): "After all the issues we had yesterday the team did a fantastic job to get the car running well and also to find a good setup despite having done so few laps. The car felt good all day; enough that we were confident in taking a risk during Q1 by not running the option tyres. It was a great strategy call that really paid off, and I think with a little more luck on the out lap we could maybe even have been one place higher. Sebastian [Vettel] looks to have a pretty clear advantage, but we've got lots of fresh tyres for tomorrow so a podium is definitely the target." Kimi Raikkonen (13th, 1:44.658): "Unfortunately today didn't go to plan as the issue with my back meant I couldn't really drive properly this morning, so we didn't get everything done like we wanted in the practice session. It's still quite painful and there wasn't much more I could do in qualifying when you take that combination of things into account. It's not the first time I've driven with a problem and it probably won't be the last time either, but I'll be on the grid tomorrow and we'll try to get the maximum from where we are at the start." Alan Permane, Chief Race Engineer: "We have mixed feelings today. It's unfortunate that Kimi had a problem with his back which caused him quite a bit of pain and affected his performance, whilst Romain enjoyed a pretty much perfect day after all the car troubles he had yesterday. FP3 went well for him, then qualifying went completely to plan. We're very happy with third on the grid and looking forward to a strong race tomorrow. We knew the last two races would be difficult for our car and so they proved to be, but we were expecting better performance once we got to the higher downforce tracks such as Singapore and this has also transpired. Our long run pace was very good yesterday with Kimi second on pace only to the Red Bulls. Sebastian [Vettel] will be hard to beat as he's in very good form, but there's no reason why a podium for Romain is not possible and we have seen some storming drives through the field from Kimi in the past too. We could be in for an exciting and rewarding race." Nico Rosberg (2nd, 1:42.932): "We've had a really good weekend so far and have been able to improve the car from session to session with some great work from my engineers and mechanics so my thanks to them. It was so close to beating Sebastian to pole this evening but I'm still really happy to have achieved second place. It's so important to start from the front here so we are in a very good position for the race. Our race pace was strong on Friday so I'm feeling quite confident for tomorrow evening. I doubt if we have enough performance to beat Sebastian but I'll do my best to have a good start and then we'll see how it goes from there." Lewis Hamilton (5th, 1:43.254): "Qualifying didn't quite come together for me this evening. I tried my best out there but I just didn't have a great feeling in the car and ultimately I wasn't fast enough. Clearly the car was quicker than what I was able to get out of it tonight so, of course, it's frustrating not to have qualified closer to the front as Nico did. So not a good day for me but that's life. We'll turn today's negative into a positive overnight and I'll be pushing as hard as I can in the race tomorrow. There are still people ahead of me that we can beat and our target will be to get on the podium, that would be amazing." Ross Brawn, Team Principal: "That was a pretty good qualifying for us, extracting the maximum from the car and running a good session so that both drivers had two fresh sets of option tyres available in Q3. It was a brave move from Sebastian and Red Bull to sit out the final run, and it just paid off for them, but it would have been nice to have given them cause to regret it. Nico put in a great lap to claim second while Lewis was just a little bit off Nico's pace today and took fifth place. That's the great thing about our team, though: we have two drivers who push each other hard, they work well together and the team works hard to find the right solutions for both drivers. Looking ahead to tomorrow's race, I think there will be a lot of opportunities that come our way. Red Bull looked extremely fast in Friday practice but strategy will play a big part in the race and it's quite likely we could see the front-running cars making different tyre choices after their opening stints on the option tyres." Toto Wolff, Mercedes Motorsport Director: "We fought tooth and nail this afternoon against what looked like an untouchable lap time from Sebastian and Nico did a brilliant job to get so close to toppling him from the top of the timesheets. Nico can be very pleased with his lap, which was the maximum the car could have delivered today, and Lewis gave a strong performance to put both our cars in the top five. Now we need to see what tomorrow brings: the start will give us a chance to make up places and the Safety Car has played a role in every race in Singapore so far, which again could open up more opportunities for us." Esteban Gutierrez (10th, No Time): "To qualify tenth is a really special feeling and one that I have missed. I enjoyed every part of the qualifying. The result today was very important, because it's not fun going into qualifying knowing that you can be around the top ten, but not getting there. At the beginning, it looked a bit difficult today, but I was pushing myself in practice and communicated well with the team. We decided that, in order to make the next step, we need to be more aggressive and be more on the edge. During the practice sessions I was able to try to do that, and it's great to see it paid off, so a big thank you to the team. I think tomorrow will be a tough race. Tyre degradation will be critical and we need to consider that. We usually have a good race pace and also had that in FP2 yesterday. I'm confident we can push for points tomorrow." Nico Hulkenberg (11th, 1:44.555): "Qualifying went really well up until the last lap of Q2. I had a problem in sector one on the DRS straight, as my DRS didn't open in time. I lost a good two tenths there, which would have put us into Q3. We need to look into that now and find out why that happened. As overtaking is quite difficult on this track, it is going to be a difficult day tomorrow. Overall it seems we have made a step forward over the past couple of races, and I hope we can continue that positive trend tomorrow." Monisha Kaltenborn, Team Principal: "We are very pleased about this excellent result today. Especially for Esteban, who showed a fantastic performance. Finally his result in qualifying shows a step forward, which we were expecting during the last few races. Nico was unlucky, because there was a problem with his DRS, otherwise he would have made it into Q3 as well. Nevertheless, this puts us in a good position for the race tomorrow. Our strong performance also showed that all the hard work over the past few moths has paid off, and that we managed to significantly improve the car." Tom McCullough, Head of Track Engineering: "Overall it was a very positive qualifying for us today. The circuit's characteristics here in Singapore have proved a particular weakness for us in the past, including last year. We have been working hard to understand and improve in that area, and we see the result of that today with P10 and P11. Esteban drove fantastically. He delivered what we knew was always possible from him. With Nico there was a problem with the DRS activation in Q2, and, unfortunately, because of that he didn't make it through to Q3. Part one is done now that we have qualified in a competitive part of the grid. Our goal now is to convert that into a double points result tomorrow." Adrian Sutil (15th, 1:45.185): "P15 is disappointing because it's some way off where we were aiming to be. We are just too slow to fight for the top ten at the moment and everyone is working hard to try and understand where we are losing out. All we can do is keep fighting tomorrow and if we do a good strategy we can hopefully gain some places." Paul di Resta (17th, 1:46.121): "I think we simply didn't have enough speed today and all weekend I've been struggling with my one-lap pace. I think we are more optimised for the race and the speed looks better over long runs, with low degradation of the tyres. But we've got some work to do tomorrow if we want to be fighting for points. We came here and tried to replicate as much as we could from last year, but we've just not been able to find the zone. It's a tough, long race ahead of us and it's difficult to overtake, but anything can happen and we will keep fighting." Dr. Vijay Mallya, Team Principal: "Singapore has traditionally been one of our stronger tracks, but for various reasons it's not suited us this year. We've not been able to get the car in the optimal working range and it's clear that we are not getting the most from the tyres. There's a big task facing us tomorrow if we want to come away with points, but history has shown that the Singapore Grand Prix can be an unpredictable race. Our long run pace has looked more encouraging so hopefully we can exploit that tomorrow and make the most of events in the race to maximise our strategies." Valtteri Bottas (16th, 1:45.388): "We're pushing as hard as we can with the car and I was pleased with my lap in Q2 as we managed to improve a bit. This is where we are with the car in terms of pure pace but we'll do everything we can to make the most of it. It's going to be a hard race for the cars and drivers tomorrow, but all we can do is our best, stay in the race and take every opportunity we can." Pastor Maldonado (18th, 1:46.619): "We have been struggling with the car since the first practice session this weekend and it is very tricky to drive. We couldn't make the tyres work today and I suffered from a bit of traffic towards the end. The conditions will be difficult but we'll do our best in the race tomorrow and try to get the maximum out of the car." Xevi Pujolar, Chief Race Engineer: "We continued doing some mechanical tests to find more grip during FP3 and it was coming to us more as the track conditions improved. We made progress with the tyre management but we could see it would be hard to get into Q2. Pastor qualified 18th whilst Valtteri was able to progress into Q2 and put in a clean lap to get the most out of the car today. We now focus on the race with thermal management of the tyres, strategy and the high potential of safety cars all things to consider for tomorrow. It will be a long, hot and challenging race for both the car and driver, but we'll be fighting as hard as we can to be in a position to bring home some points." Daniel Ricciardo (9th, 1:44.439): "That was not an easy session and we had to work harder here to get to Q3 than we did in a few other races where we have managed it. I was a bit disappointed not to get a little bit more time out of my lap in Q3, with Jenson a couple of tenths ahead and it would have been nice to get that. So I think ninth is pretty good all things considered. As for the race, the guys who went out in Q2 might have a little bit of a tyre advantage, so let's hope that doesn't have too much influence tomorrow. We will race as hard as we can and hope to stay in the points." Jean-Eric Vergne (12th, 1:44.588): "It was extremely close and it's a shame I didn't make it to Q3. On the positive side, we worked very well with the team to get a good car for qualifying and we missed out by the smallest margin, even though the car was responding well. But I think we can have a good car for the race. This is a tough track, with over 20 corners and getting each one of them right on a single lap is not so easy, from a driving point of view and also when it comes to setting up the car. I am still optimistic for tomorrow and I believe that starting twelfth, scoring points is a realistic target. It was very tight this evening and one tenth of a second could have made all the difference and I think there were a couple of places where I could have found that tenth, so it's a bit frustrating, but that's it and tomorrow will be better." James Key, Technical Director: "This track and possibly some of the conditions are not really playing to our strengths. We brought many new aero bits here, which we spent a lot of time evaluating on Friday, so that we had less time to look at other aspects of our performance. The good news is that the aero parts are working very well, but we then had a lot of work to do overnight to prepare for FP3 to get the most out of the package. I think that, in the end, we succeeded: it's extraordinarily close in the mid-field, while the top teams are some way ahead of the rest of us. We were fighting to be at the front of the middle group and we achieved that with Daniel. Once again, he did a great job to get into Q3, which we have come to expect from him now, when we have tricky weekends. Jev was less than two tenths behind him in Q2 and also did a good job. On Friday, our long run pace was better than on the shorter runs, so naturally we are looking forward to having a strong race tomorrow." Charles Pic (19th, 1:48.111): "We made a number of changes overnight for FP3 but on the first run it felt like we'd gone too much to the rear with the balance so the car felt unstable. We'd gone from predominantly understeer on Friday to too much oversteer on Saturday and even though the aero balance improved throughout the session the mechanical balance was still too much rearwards. In quali we waited for the first batch of cars to head out and then went for the first run on a new set of supersofts. The balance still wasn't right, now the car had gone back to understeer but in the end the first run was ok and with the way the car was behaving I probably couldn't have found too much more in qualifying. The good thing is that we have around seven tenths advantage over the Marussias and that's good for us in the race as it means we can look at the fight ahead, not back. I'm looking forward to tomorrow as it'll definitely be exciting and with the number of safety cars there's been here over the years anything could happen." Giedo van der Garde (20th, 1:48.320): "FP3 wasn't too bad ‘ we definitely made some progress from Friday and even though there was still some of the understeer and front locking we'd had in FP1 and FP2 the car felt better. By the performance run at the end of the session I was pretty happy with where we'd got to so I was reasonably confident for qualifying. In Q1 we went for two runs on supersofts of one flying lap each. My first run was ok but I had a bit of traffic so I knew there was more time to come. On my second run I was pushing hard and just touched the wall which cost me a little bit of time, but overall I guess where we finished is ok. The main thing for the team is the gap we have to the cars behind so now it's all about the race, making sure we avoid any problems and be there to take advantage of anything that comes our way." Jules Bianchi (21st, 1:48.830): "It was not a bad qualifying overall, but it's a shame that we were unable to improve on our first run because we were looking quite strong. For some reason on the second run we had more understeer, which is a surprise and something we need to look into for here and also to prevent this happening in the future. I am not too unhappy because this is a new track for me and I am still getting to grips with it, so I think if it all comes together for us tomorrow we can have a good race." Max Chilton (22nd, 1:48.930): "It was quite surprising to suffer a significant balance shift on the second run. The first run went well and I was only a tenth from my team-mate, so I was fully expecting to make another small step. Overall though we are closer to the Caterhams here and I think that our group of four can have a good fight tomorrow. Generally I'm really looking forward to my first night race and we will do our best to make the most of the opportunities that may come our way." John Booth, Team Principal: "Overall, a slightly disappointing qualifying result on the back of what had been three relatively good practice sessions. We have brought some suspension developments this weekend, which have definitely improved our pace, however we were not able to bring all of this together in the final qualifying run. Ultimately the pace in FP3 was very close to our nearest competitors and we were relatively confident going into qualifying that we would be able to compete with them. This was certainly the case on the first run, but both drivers reported a similar balance issue on the second run, which cost us the same improvement that everyone else was able to achieve. Going forwards into tomorrow, we have good long run pace here and we are happy with the balance of the car on high fuel. Hopefully, this will translate into a good race. The race itself looks like it could be fairly interesting with the strategy, given the two types of tyre that we have. It will be interesting to see how the other teams will handle this."